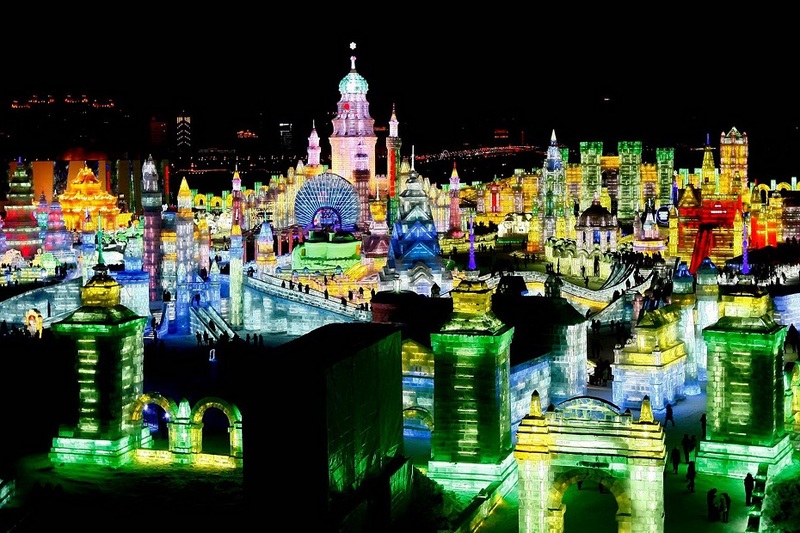 Wander through dramatic life size ice buildings, around huge snow sculptures and admire the brightly coloured ice lanterns of Harbin’s annual Snow and Ice festival. 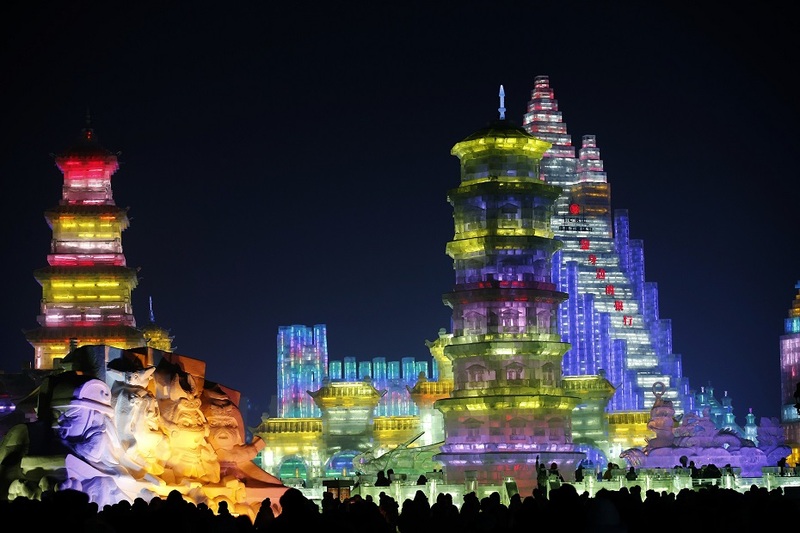 The Harbin International Ice and Snow Sculpture Festival, commonly known as Harbin Ice Lantern Festival or simply called Harbin Ice Festival, mainly consists of three theme parks: Sun Island International Snow Sculpture Art Expo, Harbin Ice and Snow World and Zhaolin Park Ice Lantern Fair. Sun Island International Snow Sculpture Art Expo is a theme park for the snow sculptures, Zhanglin Park is a theme park for the ice lanterns, Harbin Ice and Snow World is a theme park for the ice/snow sculptures, shows, lighted ice buildings and all kinds of ice/snow activities. It is the most important theme park of the three parks. The festival has been held since 1963. It had been interrupted for a number of years during the Cultural Revolution but had been resumed by 1985. Along with Japan’s Sapporo Snow Festival, Canada’s Quebec City Winter Carnival, and Norway’s Ski Festival. The Harbin International Ice and Snow Sculpture Festival is listed as the top 4 ice and snow festivals in the world. Traditionally, the Harbin International Ice and Snow Sculpture Festival open around Dec 24-25 and last to the end of February. But its official opening ceremony usually held on January 5th each year. And the time is usually considered as the official date of the formal beginning of the festival. The festival includes many interesting activities and events, such as ice and snow carnival, international ice sculptures competitions, ice lantern show, sliding, ice-sailing, sledging, ice hockey, ice football, speed skating, cross-field skiing and Alpine skiing competitions, fishing, swimming, ice and snow film art show, painting exhibition, calligraphy display, photo exhibition, folk song and dance performances, wedding ceremonies on ice, trade talks, trade fairs and all kinds of national or international sports events etc.